This page is your place for Massey Harris, Massey Ferguson Tractors & Equipment. The Massey Harris company was formed in 1891 and after going through a few transitional stages, merged with Ferguson in 1953. There is a lot of history with both of these companies and there are still a lot of these old tractors around. Enjoy! and we'll see it gets attention.......Just make sure to include the word "Massey" in the subject line! Massey Harris Home Page - an internet resource for Massey enthusiasts since 1995. The Unnofficial MH Pony Website - A place for all you Pony collectors. Carrolls Engineering Works LTD - Massey Ferguson/AGCO dealers. Many parts for vintage Massey and Ferguson tractors. 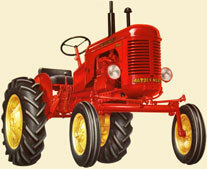 Davis Tractor Parts - Tractor Parts for Ford 2N, 8N, Massey Ferguson, TO20, TO30, engine parts & repair kits. 20+ years of providing tractor parts for new and antique tractors. Kessel's Massey Parts & Sales - A company specializing in parts for Massey Harris Pony and Pacer (Parts also available for other Massey Harris tractors). Tractor Parts, Inc. - Place to purchase Massey Harris Tractor & Equipment Decals. The MasseyBoard.com website - The place to discuss, buy, or sell. For all Massey collectors, dreamers, and enthusiasts.